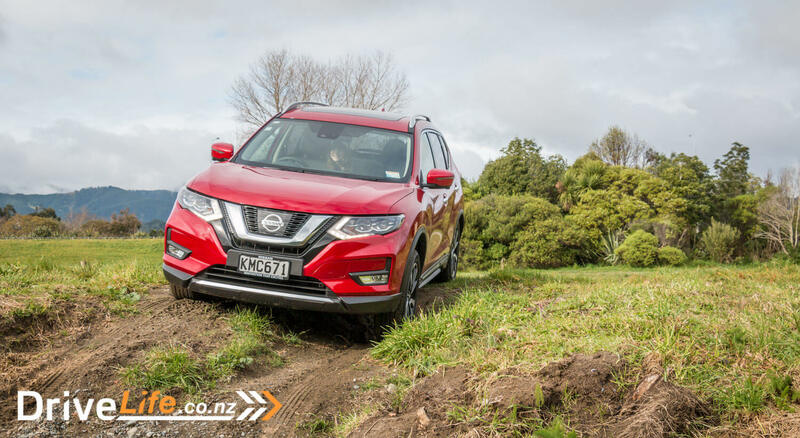 2017 Nissan X-Trail – Car Review – The X-Factor? 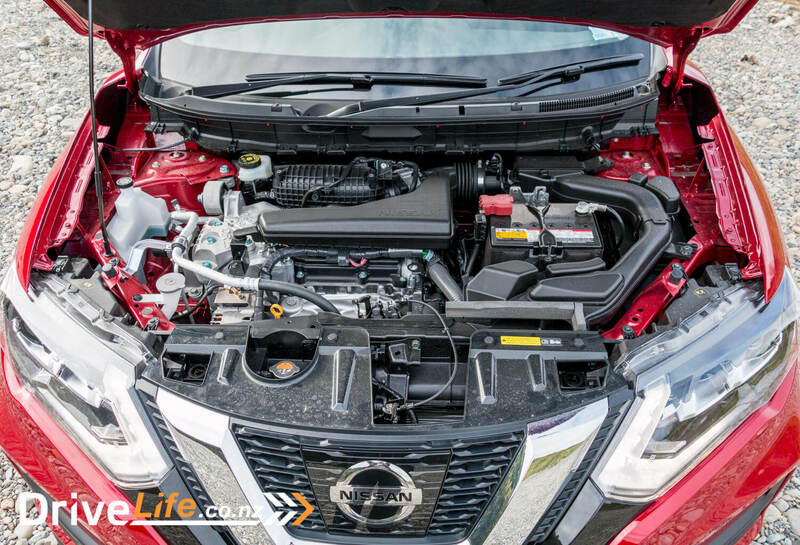 Nissan recently facelifted their third generation X-Trail, which originally launched in 2013. We tested it out for a week to see how it stacks up against its rivals in this busy market segment. There are five options with the X-Trail. 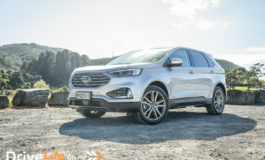 If you want seven seats, you’re limited to 2WD only, with the ST starting the range at $39,990, then the ST-L at $44,990. 4WD models start at $42,490 for the ST, $47,490 for the ST-L and topping the range is the Ti tested here, at $53,490. All models feature the same 2.5 litre four cylinder engine, making 126kW and 226Nm. This is connected to a CVT transmission. All get 17” wheels except the Ti which has 19s. Standard features include ABS, EBD, Brake Assist, Active Trace Control (aids driving on acute or sharp curves and ensures that vehicle traverses its path perfectly), Active Ride Control, Hill Start Assist, six airbags, front seatbelt load limiters and pre-tensioners, keyless entry and start, reversing camera. The Ti has several features the other cars in the range don’t get, including 8 speaker Bose stereo, radar cruise, auto dimming rear-view mirror, 360 degree camera view, blind spot warning, lane departure warning, rain sensing wipers, LED headlights and power tailgate. Seven colours are available – Ivory Pearl, Sheer Silver, Gun Metallic, Copper Blaze, Marine Blue, Diamond Black, and the Ruby Red you can see here on our test car. It’s nice to see a bit more variation on the usual dark greys and muted colours. The X-Trail is a good-looking SUV, and the Ruby Red really suits it. With some chrome highlights here and there, the odd bit of grey plastic, and those two-tone 19” alloys it looks smart but not too big or boxy. 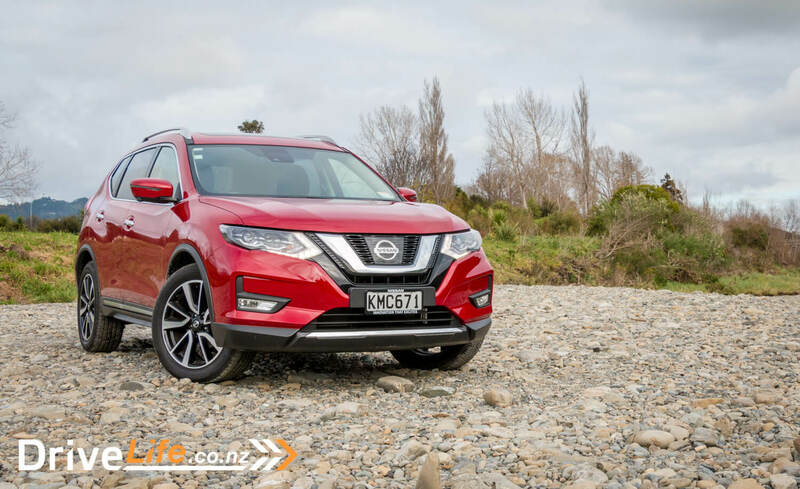 Nissan have used curved contours, a swept-up window line and some angled light clusters to make it look a bit different from the rest of the SUV pack. 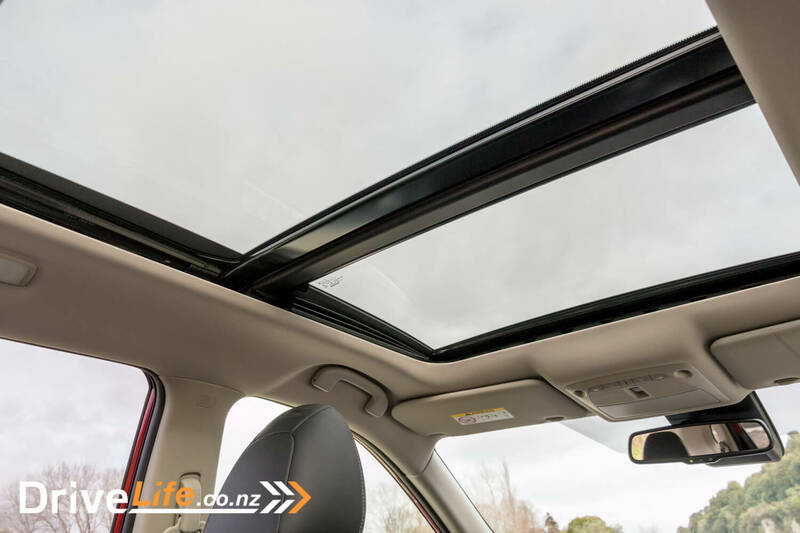 Thanks to the panoramic glass sunroof and the beige headlining and pillars, the interior of the X-Trail is nice and light. 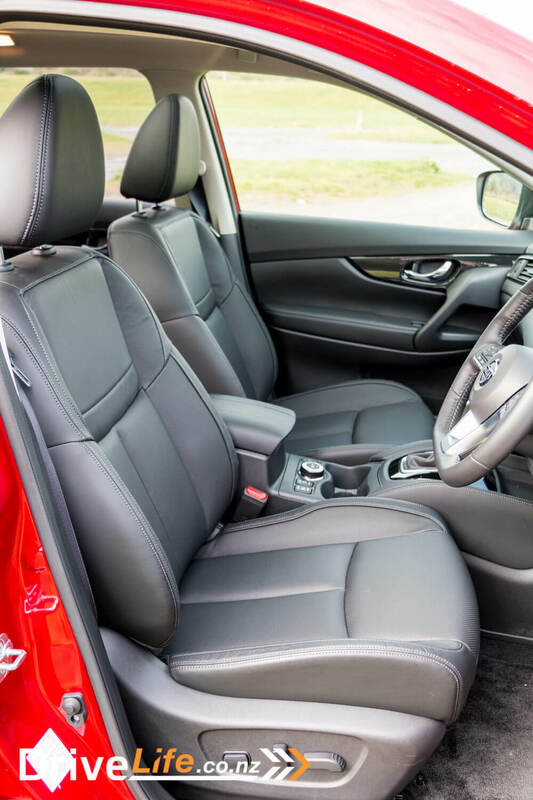 The seats are dark grey leather with contrasting stitching and are electrically adjustable in eight directions on the driver’s side and four on the passenger side. They’re comfortable too, with decent side support. Electric driver’s lumbar adjustment is welcome on longer trips. They’re also three-stage heated, as is the rear seat. You even get a heated steering wheel. The wheel is leather trimmed and has a racy flat-bottomed shape with side grips and 9 and 3. There are quite a few buttons on there for operating cruise control, stereo and phone, plus stepping through trip computer options, but they’re all logically laid out and easy to use with your thumbs. The instruments consist of two big, clear dials for speedo and rev counter with a colour digital display in the centre which can be configured as a digital speedo, compass, 4WD info display, trip computer etc. The dash is a nice simple layout with nice materials, stitched leather across the passenger side and piano-black inserts. There’s knee padding on the sides of the centre console too which is a welcome feature on long trips. The touch screen for the entertainment system is well integrated and has physical buttons around it for the main functions, as well as a volume knob, which I like. There’s also controls underneath for the dual-zone climate control. At the bottom are USB and Aux inputs for the stereo. Behind the gear shifter are two cup holders, a large central cubby with a power socket inside, and controls for the heated seats. For some reason the rear heated seat can only be operated from here, so rear passengers have to ask the driver or front passenger if they want a warm bottom. There’s also the 4x4i drive selector knob which controls the 4×4 modes. The rear seats are comfortable with lots of leg room in their standard position. They can be slid back and forth to give more cargo space if needed. They’re also 40/20/40 split for lots of load versatility. 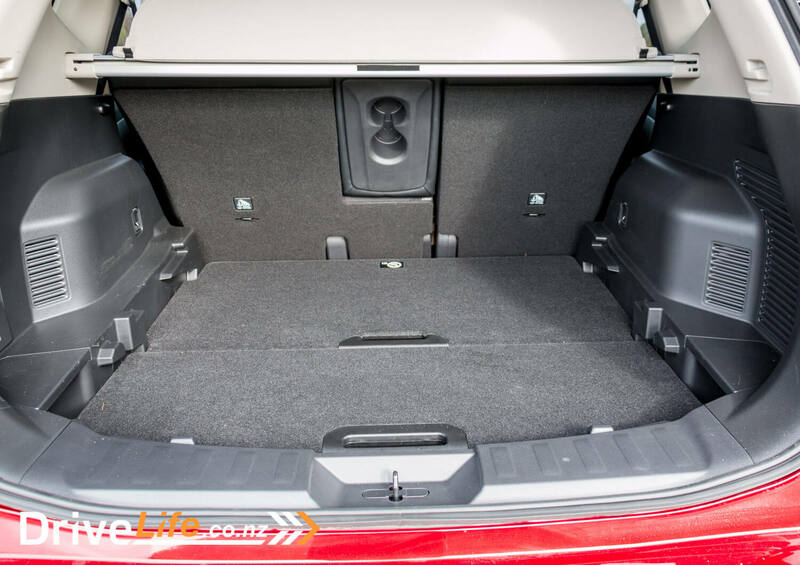 Open the electrically-operated boot and there’s a large 565-litre load area, with luggage tie-downs and a clever variable boot floor, which can be left flat or taken out in two sections then slotted in lower down for more height. 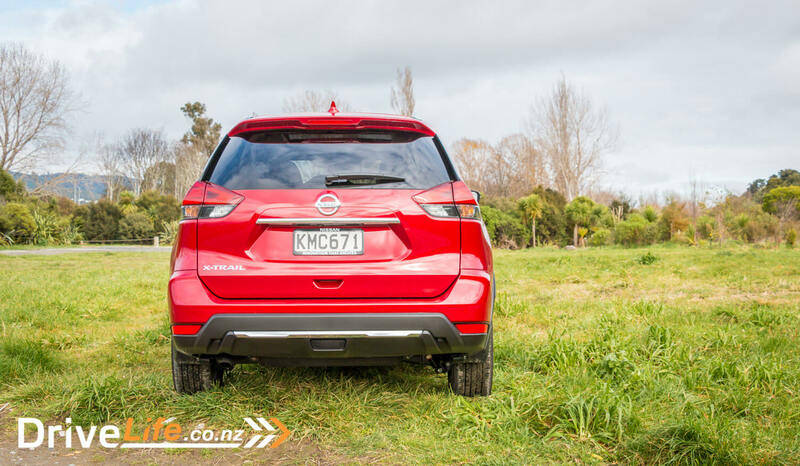 My first impressions of driving the X-Trail were that it’s very smooth and quiet. In traffic especially, it’s very well-mannered. 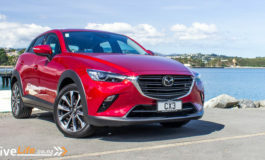 Not quite to the standard of the new Mazdas, but close. On the open road there’s a bit of tyre noise on rougher surfaces, as you’d expect with 19” wheels and big tyres, but it’s not overly loud. There’s a little body roll if you push the X-Trail into corners, but not a lot, and the Active Trace Control system does a great job of making it go exactly where you want it to. The ride is good too. No harshness over bumps and well damped. The X-Trail uses a CVT transmission, and normally I’m not a fan of them, but this one is well suited to the 2.5-litre engine. I often find with a CVT that it’ll annoy me at some point then I’ll start to notice it more and more. In this car it didn’t, it just did its job well. Occasionally it sounded a bit loud when going up a steep hill, and a couple of times on hills I felt like the X-Trail was a bit under-powered but I think it was more my reluctance to keep it at constant higher revs than an issue with the car itself. 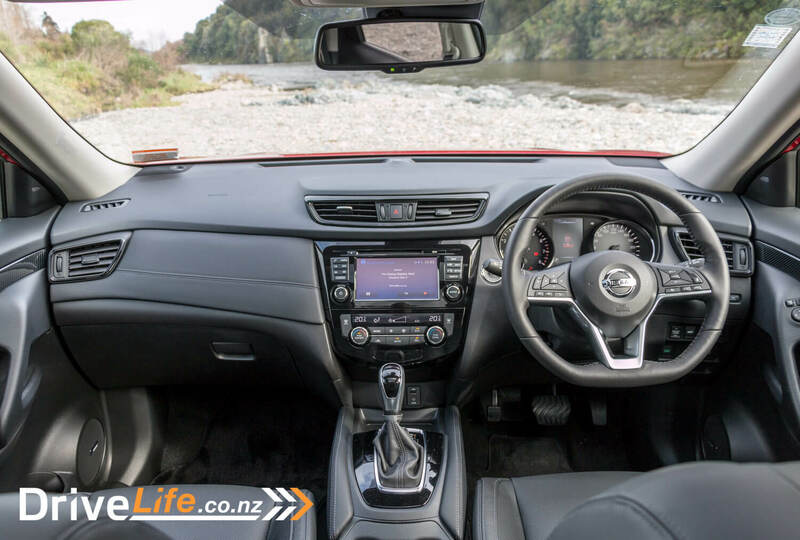 Accelerate hard from a standstill and the X-Trail will simulate a traditional auto, revving up towards the red line then dropping down, revving again to give the feel of gear shifts. This removes that CVT constant “aaaaaaaa” noise you sometimes get and makes the accelerating experience a bit more satisfying. 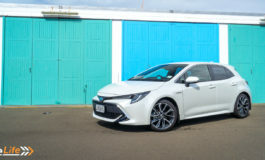 There’s radar cruise control – one of my favourite features of modern cars – and it works well most of the time but had a few little things that irritated me. It doesn’t brake going down hills, just uses engine braking so on steeper hills your speed gradually creeps up. It flashes the speed so you know it’s happening but I’d rather it used the brakes to maintain the set speed. Behind traffic it will brake to a complete standstill, but rather than wait for a button or accelerator press to resume, after about 20 seconds it disengages and the car starts to creep forward. Other than that it’s great, it shows the set speed on the information display and getting the speed set how you want it is simple. The entertainment system is good, with clear sound and decent bass. The Ti has an 8 speaker Bose system with a subwoofer in the centre of the spare wheel. Bluetooth pairing with my phone was a quick and simple operation and it was very fast to re-connect every time I got back into the car. The entertainment screen is also used for the reversing camera and 360 degree top-down camera view. This is another feature I really like, and it’s great for reversing into spaces in a big car. One thing that nearly caught me out though is that there are no sensors. I reversed into a space and stopped about 1cm short of a wooden post. Close one! My daughter and I took the X-Trail to Staglands – a good combination of motorway and winding back roads. We stopped on the way and took the X-Trail slightly off-road on some rocks, bumpy grass and sandy/muddy hills. It wasn’t really a test of its off-road abilities but there was no drama, and we did get it a little bit muddy. On the way back we were able to test the LED headlights, which are excellent, and the auto high-beam, which is a great feature and works very well. As I said earlier it’s a busy market segment but the X-Trail stands up well against its rivals. I liked the X-Trail. It was comfortable on the school run and on longer trips. There’s a decent amount of equipment for safety and comfort, with some premium features that you don’t often get at this price point. There’s a lot of competition in this market segment, but the X-Trail is a solid choice.